Viggo Mortensen is standing in an army surplus jacket, faded jeans and stocking feet, sipping his maté tea ('it's a South American herbal tea,' he says) from a small wooden cup and looking somewhat mischievously onto the rooftop outside his suite at the San Francisco Ritz-Carlton through the narrow gap in a half-open window. 'You wanna go out there?' he says ten seconds after his publicist leaves the room, having seen him settled into a chair for this interview. The actor smiles in a way that makes the vague hints of grey hair at his temples shift slightly upward and tries to crank the vertically swinging window open far enough to step through. It jams after making a space about 14 inches wide - probably by design to prevent people from climbing out on the roof. But we squeak through the opening afforded us, our backs against the frame and bellies pressed to the glass, then make our way around a corner to a nice spot in the sun overlooking the skyscrapers of the Financial District. 'She won't be able to find us when our time's up,' I say, feeling a little sorry for the publicist as we sit down against the hotel's exterior, several stories up. 'She'll find us. But she'll have to climb out,' Mortensen laughs. In many other actors this behaviour might seem like calculated, celebrity-rebel image-making, but the pensive, unrufflable Mortensen is clearly just a guy who doesn't take well to being cooped up in a hotel room all day and yearns to be outdoors. This may be why he's such a natural playing celebrated cowboy Frank Hopkins in Hidalgo, the film he's in town to talk about today. Hopkins, a Pony Express rider by trade and half American Indian by birth, became a legend in 1890 when he and his undersized mustang (whose name lends the film its title) were the first Westerners to enter - and much to everyone's surprise win - a race called the Ocean of Fire that traverses 3,000 parched and gruelling miles of the Arabian desert. A larger-than-life adventure that takes some of its narrative and stylistic cues from old Westerns (the 'true story' is embellished with swordfights, kidnappings and shootouts), it's a film that Mortensen is the first to admit is more popcorn than history. Hopkins is a legend Mortensen was more than fit to play, especially having learned to ride as a kid and having spent so much time on horseback in action scenes during his star-making turn as heroic king-to-be Aragorn in the Lord of the Rings movies. ('I hope it's obvious that he did almost all his own riding,' says Hidalgo director Joe Johnston.) 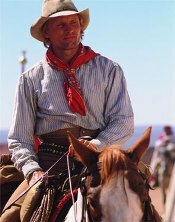 But as much fun as he had riding every day (Mortensen bought one of the horses that played Hidalgo after bonding with the animal on the set), the actor also felt an obligation to the myth of the cowboy. 'In some quarters,' he says, 'the cowboy has gotten a bad reputation. The image of the cowboy has for some people come to mean intolerance, that your individualism is at the cost of others or other societies. That's not really what a cowboy is. Another famous cowboy trait - or a trait of movie cowboys at least - is their amazing ability to keep their hats on no matter how fast they're riding or what kind of tricks they're performing, a notion that makes Mortensen chuckle. As he's finishing a sentence, a humorously exasperated 'Where are you guys?' floats around the corner of the roof. 'You've got about one minute,' she hollers back. While his relaxed attitude toward his schedule already has him running, he's not after that rebel-making image, so we get up and head back toward the narrow window. But I ask one more question, playing off what he said about not being obvious. I tell him I've interviewed two directors he's worked for (Johnston for this film and Tony Goldwyn for A Walk On The Moon), and both said almost the exact same thing about him: Viggo Mortensen doesn't have to say much and you get a lot. 'So I'm curious if you have a "technique',' I say. 'Really?' he replies. 'Well, the foundation of good acting is reacting, and that's often something you do without words. You do as much as you can, you develop a point of view about (your character), you do research and you continue to do it. As I'm sure Anne the publicist could now attest, with Viggo Mortensen, you never know what's going to happen.